Print out the offer card & write your name on the back of the card. 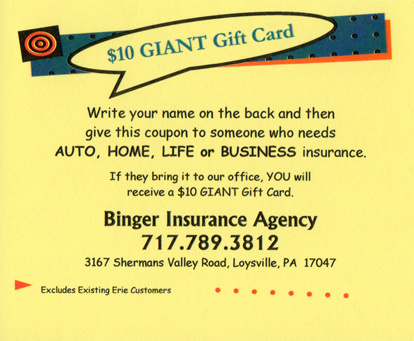 Give the card to someone who needs Auto, Home, Life or Business Insurance. If they bring the card to our office, you will receive a $10 GIANT Gift Card*. * Offer excludes existing Erie Insurance customers.